The BBC has reported that Police in Oxford are urging residents to register their bikes so they can be traced if they are stolen. According to the BBC between June and August, 837 bikes were taken in the city – a rise of 141 compared to the same period in 2010. Sgt Matt Sulley from Oxford police station said bike theft was a huge problem and returning cycles to their owners was the biggest issue. He said if cycles are registered at immobilise.com police can easily identify the original owners. In Oxford, Thames Valley Police are currently holding hundreds of bikes. Sgt Sulley said the large number of cycles in Oxford made thefts a particular problem. He said that also the large portion of old-style houses in the city meant it was difficult for people to access gardens and sheds to properly secure their bikes. There are also criminals making a business out of it. Lots of bikes are being stolen and then stripped for parts which makes them very difficult to trace. 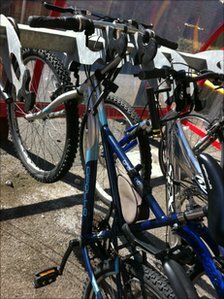 We have also seen a number of very expensive bikes, worth thousands of pounds, locked up with cheap locks. Between 5 and 25 September 2011 neighbourhood policing teams will be at key locations in Oxford advising people about ways to protect their property. South Yorkshire Police advise – If you love it, log it! The recommendation, published on the South Yorkshire Police website says, Police are urging people to log their expensive property and any other precious belongings on immobilise.com – the world’s largest FREE register of ownership details. In addition to acting as a major deterrent to criminals, the big difference with Immobilise is that as well as getting your stuff back if it’s lost or stolen, the system helps to catch the thieves as well! Any item can be registered on Immobilise. The easiest items to log are electricals, or anything that has a serial number, but you can even log jewellery or ornamental items using the photo upload and description functions. You can register as many items as you like, and then if they are lost or stolen you simply log back on to register them as such. The police can check any property they recover, whether that’s when a person is brought into custody for any reason, property recovered from criminals in raids, or even during one of their now routine checks on second-hand dealers. And if they find anything that is listed as stolen, not only will you get your belongings back, but the thieves can be brought to justice.